After writing the adorable Princess for Hire series, the touching, funny Sean Griswold's Head, and now Going Vintage, Lindsey Leavitt has established herself as a stellar writer of light contemporary YA fiction with uplifting messages. Mallory is a likable albeit neurotic main character. When something doesn't go right for her, she jumps to conclusions and goes to extremes to make things different and better. Here, she decides to live like her early 1960s grandmother. I frequently wanted to throttle Mallory for her short sightedness. She was convinced that modern technology was the root of all her social problems and that life was wonderful when her grandmother was in high school. Even though her grandmother didn't enjoy talking about high school and clearly was hiding something. And despite the fact that, for all of technology's problems, the lack of technology makes her life a lot harder. Perhaps it was easier for me to realize that high school is hard no matter the era because I'm no longer a teenager or because Mallory chose to ignore things that were obvious to the reader. At the same time, I couldn't help sympathizing with Mallory. Sure, she was looking for the wrong solution to her problems and ignoring her family around her, but her intentions were good. And I did feel bad that she was stuck with a tool of an ex-boyfriend. Family plays a big role in Going Vintage, as it does in all of Lindsey's books. Her parents are a bit crazy but they clearly love their kids. Mallory's relationship with her younger sister stood out beyond all else in this novel. It's the type of sibling relationship anyone would long for. They're best friends, they rely on each other, they trust each other. The relationship isn't perfect; they fight, they take each other for granted, but at the end of the day they are inseparable. Mallory's relationship with her grandma is also a big part of the book. The craziest part of that was that Mallory's grandma was born in 1946 - which makes her a year younger than my dad. This made me feel really old. There is a little romance in the book. Mallory starts off breaking up with her immature, two-timing boyfriend. She ends up befriending Oliver, her ex-boyfriend's cousin. I loved Oliver. He's quirky, independent, funny, and geeky-cool. I also really liked that romance was a part of, but not the entire framework of the book. Mallory's self-growth is always the central theme. 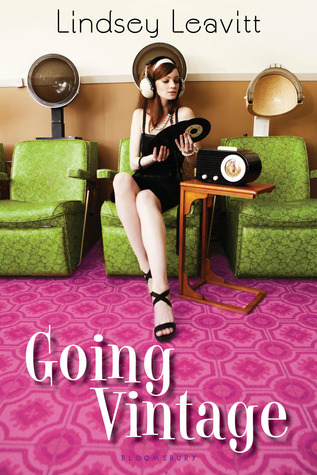 Going Vintage is a super cute book. You may roll your eyes at Mallory's crazy vintage antics, but you'll cheer for her too. Lindsey's created a real person: flawed yet good-hearted with an imperfect family who goes through all too realistic experiences even if her reactions to them are a little strange. You should definitely pick this one up! I can't wait to read this... I actually won it from a blog and after reading your review I am even more excited to get started! Wooh! I really enjoyed this one as well. And I'm looking forward to reading more of this authors books! I've seen this book around and had no idea what it was about, it sounds interesting. Apparently there is an actual teen who did something like this recently and Penguin is publishing her experiences as a memoir called Popular: Vintage Wisdom for the Modern Geek . I wonder if she read this book first. Hol cow, Mallory's grandmother was born in 1946? Then she is also a year younger than my mom. Now I feel old. My grandmother was born in 1921!! Anyway, I had the same frustrations with Mallory. I just couldn't quite understand why Mallory was so sure life in the early 1960s was easier. I mean, even as a high schooler, I never thought that. But I did enjoy this one. Before this review I was ready to give up contemporary YA for good. I prefer books that take place in other worlds (fantasy, dystopian, sci-fi, historical...) and stories set in modern day are usually depressing or silly. I recently looked through a contemporary series I used to love and I just couldn't find what made is so addicting. I can appreciate a well written contemporary but I just don't enjoy them like I do a good fantasy. But I think I want to try this book out. The idea of a teenager TRYING to live without technology is pretty funny and I like that her family is such a big part of the story. So, I guess I'll go add this to my to-read list. I seriously adored this story. It was so cute and fast and fun -- loved the family dynamics, too. No dead parents here! I can't imagine living without technology (unless I lived in a library with a zillion books and my dogs and had my food delivered by magical fairies. Then I'd be able to do it because I'd never leave. I'd become a hermit. But that's another story.). A light contemp with uplifting messages sounds great to me. Love that family plays a big role in the book. Not may YA books have parents involved. Nice review. I had a lot of problems too with Mallory thinking that living in an older era would solve everything-it was so dumb and I wanted a smarter MC. I did really love the family stuff especially Ginnie, best YA sister! I keep hearing positive things about this one. It sounds like such a fun, cute premise. Definitely one I think I'd enjoy.